Mayor Martin Walsh will kick-off the Patriot’s Day Celebration in Boston on Monday morning at 9:00AM with a Flag Raising Ceremony on City Hall Plaza. The Patriot’s Day Parade will march from City Hall Plaza and continue onto Kings Chapel on Tremont Street where there will be a wreath laying ceremony at the grave of William Dawes. The parade will proceed to the Old Granary Burial Grounds where a wreath will be laid at the grave of Paul Revere. The re-enactment of Paul Revere’s ride occurs at the Paul Revere Mall on Hanover Street in front of the Old North Church at 10:00AM. The re-enactment of William Dawes’ ride occurs at Eliot Square in Roxbury at 10:00AM. 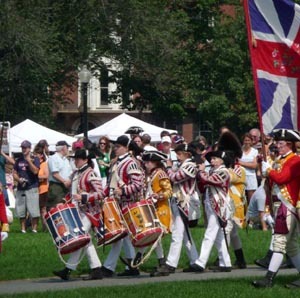 Celebrate Events Leading to the American Revolution Honoring the first battle in Lexington and Concord! Patriot’s Day is celebrated in Massachusetts to remember the events that took place in Boston leading to the American Revolution. Traditionally a morning flag-raising ceremony in Government Center is followed by speeches and a Patriots Day Parade. The parade stops at the Granary Burying Ground for a short service and wreath laying at the grave of Robert Keayne and Paul Revere. At the end of the parade The Massachusetts Lancers stage the rides of Paul Revere and William Dawes. From their start in the North End near the Old North Church, each ride through Boston making stops along the way to greet people until they reach the Minute Men Statue at Lexington Green. Revere’s reenactor stops at Foss Park in Somerville, Hall House in Medford Square and Arlington Town Hall before arriving at Lexington Green. Start Location: City Hall Plaza Government Center Congress St.
Take the T, as this is also Marathon day.